MY AWARDS FOR THIS WEB SITE ! We thank you for inviting us to visit your home on the Internet. We applaud your site's ease of navigation, obvious hard work, and invaluable content. 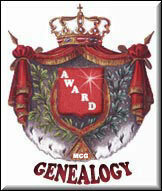 It is with great pleasure that we give you the Genealogy Award. Your site has been chosen as a winner of The Southern Nytes Award of Elegance for this month. It was a pleasure to visit your site. I am impressed. There is only one Southern Nytes Award. We do not give Bronze,Silver, Gold, etc. Your site has to be exceptional to win this award. 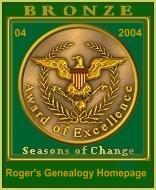 Your site has been chosen as a Bronze Winner of the Seasons of Change Award for this month. I enjoyed visiting your site. Proudly display the Aloha Award to let others know that your Web site is informative, unique and has won this prestigious award. I have reviewed your website and find it complies with the criteria required for the presentation of the Genealogical Research Award. You have obviously put a lot of time and effort into your webpage. I have visited your site and it looks like you have put a lot of hard work into it. I enjoyed reading about Tolleif Thomsen's Imprisonment and the Mythic Mutiny. I would like to award your site with my Norwegian Roots Genealogy Award. I have added your site to the "Awarded Sites" page on Norwegian Roots". Your site was well worth the visit! 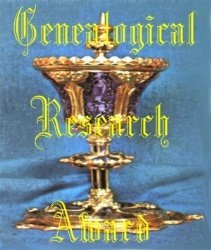 I am honored to present you with the "Award of Excellence" for the Genealogical and historical treasure that you have painstakingly researched and shared with the World through your attractive web site. My visit to your site was an intense and enjoyable experience. Congratulations!